CWGC records the location of a British soldier's grave under a railway station with the marker on the platform. This odd location is in Ogies, Mpumalanga - to the east of Johannesburg. CWGC gives no further details on the identity of the dead soldier. 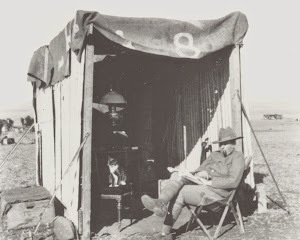 The grave marker and its location are photographed on BoerenBrit.com, they relate a story behind the grave taken from Anecdotes of the Anglo Boer War by Rob Milne (Helion 2000). In February 1902 this area was open veld and in a clash between the Bethal Commando and Colonel E.C. Knox’s column a Trooper Bryant, 26th Mounted Infantry was killed on February 1st and buried where he fell. The metal cross came after the war. Later, after the war had ended a coal mine was started and the area developed. The new railway and railway station was built over Bryant's grave. Currently the grave is covered by the men's toilets and the grave marker moved to a platform sitting in false grave plot. Looking at each; G Bryant was killed in April, J Bryant, Connaught Rangers was captured. The only candidate is Pte 5241 J Bryant, Somerset Light Infantry and 26th Mounted Infantry. But, he died of enteric on February 3rd at Sturman's Ranges some 200km to the south-east near Wakkerstroom. He now lies buried in a concentration cemetery at Wakkerstroom. And, the grave marker shows "Pte J Bryant 26th Mounted Infantry", the service number appears to be '3524'. No Bryant with this number or a variation on can be traced on the medal rolls, service papers, Soldier's Effects and newspapers. The other problem with this anecdote is that Colonel E.C. Knox died of pneumonia in London on February 18th, 1902. He could not have been in South Africa on the day this mysterious soldier was killed. This remarkable story came from a thread on the Anglo Boer War forum discussing deaths at sea. The story is from Captain JC Robinson, master of the troopship Kildonan Castle, whose articles have been published in To the Sea in Ships, Royd Press 2013. Captain Robinson describes how an unnamed soldier who died while the ship was anchored in Table Bay. The descision was taken to bury him at sea rather rather onshore. Using the The Register, I have identified the most likely soldier as Pte 4020 J Taylor 4th bn West Yorkshire Rgt. His entry in Deaths At Sea on FindmyPast shows he died at 6:30am in Cape Town from the effects of pneumonia. There is no latitude and longitude recorded which is normal for deaths truly occuring "at sea". "I was in the Kildonan Castle, H.M. Transport No. 44. We arrived in Table Bay one morning about six o’clock, with 2600 troops on board, the weather being very hazy, and the Bay crowded with vessels of all descriptions. I counted 70 myself, but there were more. We anchored off Moulle Point and signalled our arrival. One poor fellow, a soldier, died after we brought up — the only one we lost during the voyage. The Port boat came off after breakfast, blowing his fog-horn, because it was getting very thick. Having received pratique, I reported the death, and requested that arrangements should at once be made to land the body for burial. This was agreed to as necessary, and the launch returned to attend to the business. By the time he reached the dock the fog had closed down dense and white as milk, so that we could not see our own funnels 50 ft. away. The chorus of ship’s bells near and far in the calm, fog-bound bay was quite remarkable, and continued for three days and three nights without intermission! We waited patiently for the return of the launch, keeping our ears open for any indication, but all in vain. The third morning the surgeon and commanding officer came to me and asked what was to be done? After anxious consultation it was decided that we must bury at sea. It goes without saying that I dare not move the ship, so the “office” must be performed by means of a lifeboat. Let it be understood, first of all, that no “committal” must take place inside of 15 fathoms, and we were anchored in 8. A chart of the bay and approaches was laid out, and a position marked upon it with a cross upon it for the “launch.” The course from ship to the cross was laid off, and the distance measured. The lifeboat was fitted with a compass, and a patent log, as well as the chart, and a lead line. A special signal by foghorn was fixed upon, which was to be sounded every half minute exactly from the start until the return of the party. The second officer and boat’s crew who were to go, accompanied by t wo military officers, were put through a rehearsal of the programme. The body was duly placed in the boat, and the funeral service was conducted on board immediately above; and as the firing party and the buglers made their “salute,” and sounded the “Last Post” on the forecastle head, the ambassadors of death departed on their mournful mission. They were immediately lost to sight; even alongside the ship they had been but dimly visible from the deck, but the regular splash of the oars continued audible for a long time in the breathless calm that prevailed, and gradually died away into silence. Our prearranged signal was religiously observed, and a tense and dramatic quietness pervaded the whole ship during the interval of sound. I confess that I was extremely anxious myself. The conditions were so unprecedented. I knew that every human precaution had been taken, and that we had only done what was right and necessary; but the minutes dragged along with leaden measure — five, ten, twenty, forty! Hearts were thumping painfully; every ear was strained to the uttermost. A solitary boat, with nine men and a corpse, shut out from all audible or visible connection with a living world, upon a formless waste of secret waters! The mind conjured up all kinds of horrible possibilities. Whispers here and there - listen - I think - I think - I’m sure - hush - it’s fancy - no - don’t you hear? I do - Yes! - and at last! After forty-five long-drawn minutes we did faintly hear that welcome rhythm as it gradually became audible to all — and a spontaneous cheer went up from 2000 throats that must have encouraged the still invisible members of that devoted band to a realisation of safety and renewed effort. What a great relief it was to us all when we received them safely on board! Trouble broke out in the evening of New Year’s Day with fighting between sailors from HMS Thetis and West Indian Rgt soldiers. One of the West Indians was badly injured and sent to hospital. The following evening sailors from HMS Thetis gave a concert in aid of a local charity. A party of West Indian soldiers armed with “clubs and razors tied to sticks….raided the town”. Civilians, including women and children were injured, a man had his skull broken. Twelve sailors were injured “more or less seriously”. The West Indians were joined by more of their comrades who broke out of barracks. There ensued a chaotic night with their officers failing to get the men back to barracks as they rampaged around. The Soldiers and Sailors Rest Home was attacked “and broke the doors and windows to atoms”. Mr Brodrick refused, and in April two companies from the 3rd bn returned to the island. The War Office informed the 1st bn that the detachment would not receive the QSA medal. (WO100/287p383) In March 1902 Lieutenant-Colonel AL Bayley, commanding the 1st bn sent a nominal roll (in triplicate) to the War Office of the men of the 1st bn stationed on St Helena between September 4, 1900 and January 13, 1901. (WO100/287p382) This roll is preserved in the medal rolls WO100/287 pp387-388. There are 183 names on the roll, ordered by rank and surname. The final name on the roll is Private 309 A Ricketts, the list could be incomplete, it seems odd no other surnames are recorded beyond the letter “R”. Additionally, Corporal 859 T Padmore earned the Ashanti Star 1896. No officers are recorded in the medal rolls for the 1st bn on St Helena, they didn’t get their medals but remain anonymous. Three officers of the 1st bn received QSAs for service in South Africa: Major HA Hill (attached Royal Scots Fusiliers), 2nd LT JH Forshaw (attached 3rd bn East Lancashire Rgt), Lt A Peel (previously Cpl 5423 2nd bn King’s Shropshire LI).